Uncover new and exciting adventures in Annapurna Base Camp by taking part in our small group tours. Go sightseeing at your own pace surrounded by travellers like you. 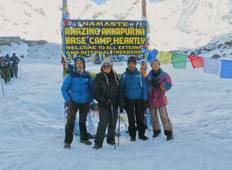 Provided by top tour operators & travel companies, our small group tours in Annapurna Base Camp will offer you the perfect balance between spending time on your own and group activities. "Excellent experience and service The three of us had an excellent trekking to ABC..."
"My husband and I did the abbreviated Annapurna trek with a small group and my only..."
"Great experience , excellent arrangement ." "The planning and organisation of the trip was superb. Transportation could have been..."
"Nice group, very friendly guides. Only the second day was little bit boring since..."
"Nice trip , see you again"
"Very good service! Highly recommendable!" "The top view of mountains and i had the best guide! :)"
"This trip was amazing! The food was delicious, the sites were incredible, and I did..."
"We did the Annapurna Base Camp trek with Outfitter Nepal. We were a group of 14 family..."
"I’ve been trekking with Destination Unlimited Treks for many years and their services..."
"It was my first trekking in the Himalaya and thank you Peregrine Treks for making..."
"“Awesome memory of a lifetime experience”. 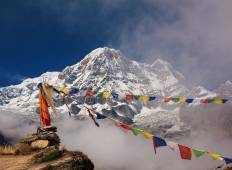 The combination of Everest base camp..."
"Annapurna in 7 days is a well thought itinerary, We enjoyed a lot in the trek and..."